One of the two horror film sleepers of 1977 were not necessarily definable under the usual typecasts of the genre: David Lynch’s Eraserhead, which drew itself more to a kind of surreal horror from paintings and animation; and this film, George A. Romero’s Martin, where the horror is not what is usually expected from the director. Indeed, before I saw this film I generally related Romero to the status of a horror-film maverick, where he brings out much of the violence and tension in his films that we as the audience wouldn’t get on TV. His subversion’s of the genre, however, can be sensed in his ‘living-dead’ trilogy (soon to become a quadrilogy later this year), as he makes his characters and situations, for the most part, far more believable aside from the dark fantasy/graphic comic-book quality of the designs and look of the films. But this time, for Martin, he made a story that deals with the human relationships even more so than the creepy and supernatural elements of his other works. 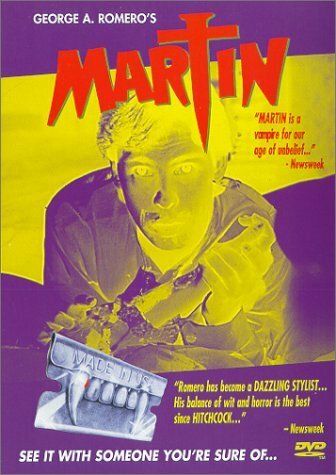 Martin is a vampire movie, and there are some key scenes that deliver the good for the fans (and, again, going against expectations, as if Romero was a “new-wave” filmmaker from Europe), but also giving something for people who may not be expecting depth in the themes and situations with these people. The main characters of the film, aside from the protagonist Martin (a twisted and very confused protagonist at that), are all developed very well, and aren’t necessarily one-sided or even two-sided portraits of caricatures in other vampire movies. For example, the sort of ‘Van Helsing’ character in this film is in the form of Martin’s uncle Tada Cuda, played by Lincoln Maazel. He’s the only one that knows, and is terrified of, Martin’s secret life, and upon first bringing him into his home, Tada tries to use crosses and holy water on Martin. Martin can’t be fooled, and so Tada resigns, for the moment. While Tada is the kind of typical, harsh old man that acts like something of an antagonist for him and Tada’s daughter, he may not be entirely one-sided by the end of the film. The theme of Christianity, as shown in certain variables as the film cuts to black and white flashbacks, explores it in a very on-target way. Why do vampire movies have this kind of magical ability to wash everything with a cross and silver and garlic? Martin seems to ask these same questions, when he calls up a radio show (his only real output of his frustrations, though a media that still treats his despair as a joke). Martin himself, played in a peculiar, low-key way is John Amplas (an actor who has his peak in this film, having only appeared in bit parts in other films, mostly Romero’s). He is often observing, never sure what it is he’ll say, and much to how his character is and evolves, has skills of a predator. He was perfect for the role, as he has a level of vulnerability and sincerity that can be connected to, while at the same time in a conflict about what to do with his craving for blood. That the other actors, all indie actors (one of them, Christine, played by Romero’s wife), are really quite good with the material, helps the feel and flow of the film. Some directors can’t stand editing their own films (John Ford once said he hated sitting in on it, as other have as well), and while they sit in with the editors and make notes, few actually go to the machines and do the work themselves. Romero is one of the few that seems to really enjoy the process, and has fun with it. In some ways his movement within the frame, and with the pacing of Martin’s sense of reality and of the past, makes the film seem like it should almost belong in an art-house (so to speak) as opposed to at a midnight cult-horror theater. That’s not to say he doesn’t have it in him to give people their money’s worth expecting to get the pants scared off their waists. In fact, there is one big sequence in the film (where Martin stalks and attacks, needle in hand, a married woman who’s having an affair) that is one of Romero’s most suspenseful and unusual. Not to mention there is an ending that wraps everything up rather terrifingly- one knows something like this would be coming, but not from this direction.